We value our patients' experience at Rocky Hill Chiropractic Center. If you are currently a patient, please feel free to complete the following Patient Experience Questionnaire. And remember, your referral is the nicest compliment you can give us! I have never met anyone with all the knowledge of Dr. Maryott. The first time I saw Dr. Maryott was the day after my Mother's funeral and the stress had caused my back to 'lock up'. He gave me adjustments and massage and, because he treats holistically, also incorporated a mini grief session into my appointment. After several treatments I was much better. I have been seeing chiropractors for over 20 years and never have met anyone with all the knowledge that Dr. Maryott has in all different types of alternative methods, such as: Qi Gong, Tai Chi, etc. He is willing to teach you everything that will help your particular problem and make you feel better. 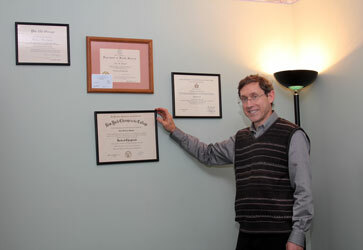 He is dedicated to learning more to help each of his patients. If there were only one Doctor I was allowed to see with my particular back problems, it would, without a doubt, be Dr. Maryott.